ShukerNature: PORTRAITS OF A POTOO – NEITHER AN AVIAN ALIEN NOR THE BIRD FROM HELL! PORTRAITS OF A POTOO – NEITHER AN AVIAN ALIEN NOR THE BIRD FROM HELL! Facebook never disappoints me as a rich source of the exceedingly weird but also very wonderful when it comes to the animal world, and yesterday was no exception. During its early hours, I was browsing the recent posts of various FB friends when I came upon a quartet of photographs depicting a truly remarkable- (and macabre-) looking bird, equipped with a disproportionately huge mouth as well as large, unearthly black eyes. One of those four pictures opens this ShukerNature post, but here below are all four of them. Despite a prolonged internet search, I have been unable to uncover the identity of the person who snapped them. They had been posted by FB friend Michael J. Smith, who hoped that the bird portrayed in them was genuine, and I was happy to report that indeed it was. Looking at the four photos, I readily recognised the bird to be a potoo. True, there is a superficial similarity to the frogmouths, but having recently seen and photographed a living specimen of Australia's tawny frogmouth Podargus strigoides at very close range, I could tell the difference straight away. 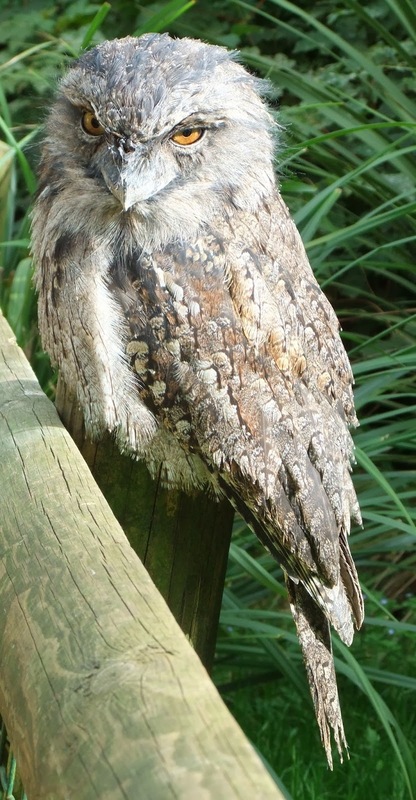 As a good rule of thumb, whereas both bird types have strikingly large mouths, those of potoos are much bigger than their beaks whereas those of frogmouths are much the same size as theirs. And as can be seen from the photo quartet, the bird depicted in them had a very small beak in proportion to its mouth. Eager to discover the history of these photos, I spent some time searching for details online, but little could be found. They had apparently first attracted significant online interest just a couple of days earlier, when posted on the Reddit website, and had subsequently appeared on many others worldwide. However, I discovered that they had initially appeared much earlier, having traced one site that featured them in October 2013 and another that had featured them even further back, in mid-April 2013. 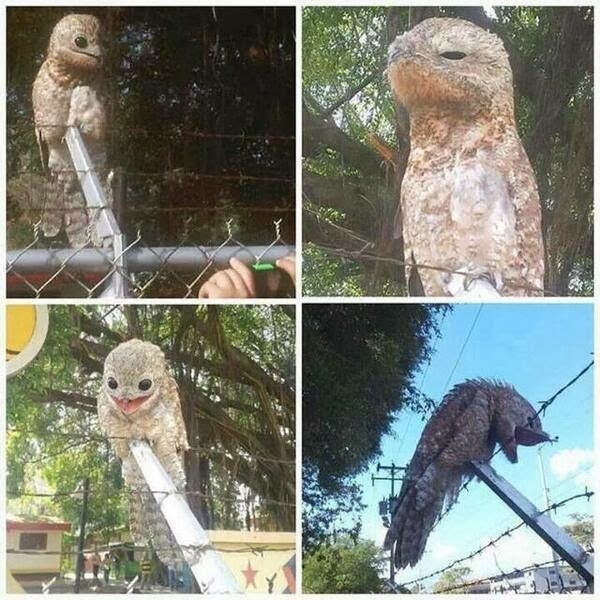 On a Vietnamese website that I consulted (click here), it stated that the bird had allegedly been captured on the outskirts of a rural Venezuelan town, which if true provides further support for a potoo identity. Judging from the comments on a range of other websites that I accessed, however, there has apparently been much wild speculation among non-ornithologists concerning the nature of this bird. Some contributors have voiced the opinion that it is an alien creature, or even a demonic entity, and others that it is an effigy or a taxiderm gaff (presumably one with a beak capable of opening and closing, judging from the differences in beak appearance present in the photos!) created specifically to fool or horrify its observers. 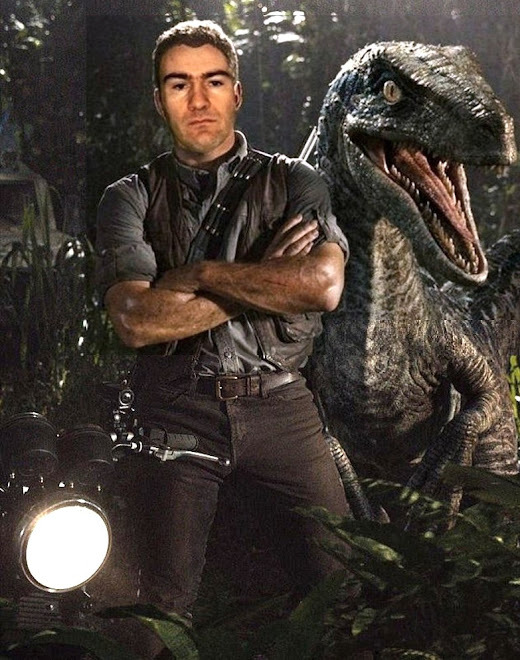 So is the mystery of the bird with the monstrously large mouth solved? Not quite. There is still the disconcerting matter of its uniformly black eyes to consider. This is because in the eyes of potoos, the black pupil is normally prominently ringed by a wide gold-coloured iris. Having said that, when I did a Google image search of photos depicting the eyes of potoos (click here), I discovered quite a few photos of specimens with entirely black eyes. So how can this puzzling discrepancy be explained? Could it be merely a lighting effect – the eyes appearing dark when viewed in subdued light? Bearing in mind that all potoos are nocturnal, it is more probable, however, that the pupil can dilate sufficiently in subdued light to obscure the gold iris encircling it. Judging from the range of eye states represented in the photos thrown up in the above-mentioned Google image search, I suspect that the latter hypothesis is the correct one, but if anyone out there can offer further information, I'd greatly welcome details here. "I think some (maybe many) bird species' eye colours change with age. My own African Grey parrot Gizmo's eyes were entirely black as a baby. Then his iris changed to white after the first year and now he is eight the iris will go increasingly yellow with age." Finally: if you think that potoos look somewhat ghoulish, just wait until you hear what they sound like! Click here for the eldritch utterances of a great potoo Nyctibius grandis. There are also several good photos of great potoos with orange eyes online when images for this species are Googled, and the mystery bird's plumage matches that of the common potoo, not the great potoo. Hey Karl. The potoo shown in the new photos is indeed a Great potoo, not a Common or Grey potoo, I think: the former has a dark brown iris and a plain head, whereas the latter has yellow irides, dark markings around the eye and (usually) dark spots in the middle of the breast. The orange-eyed 'Great potoo' images online are Common potoos. Hi Darren, I'm not sure. The top-right pic in the quartet shows that the bird does have dark spots in the middle of the breast, and Wikipedia claims that the great potoo has an orange eye (i.e. iris), not a dark-brown one. I'll check this out further. 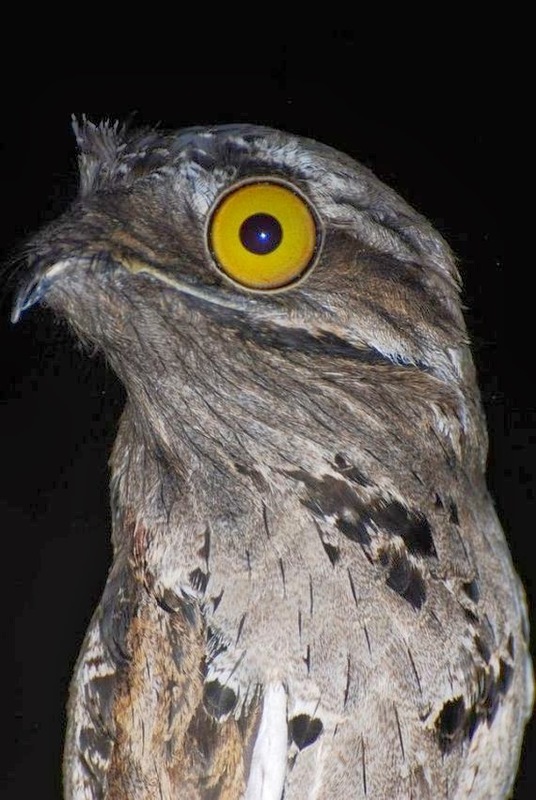 According to Birds of Peru: Revised and Updated Edition, the juvenile great potoo is "particularly 'ghostly' white" in colour, and has brown iris, neither of which matches the black-eyed grey bird in the photos. Intriguing. It states that the great potoo's irides are "brown to dark brown or chestnut", but therefore not black. 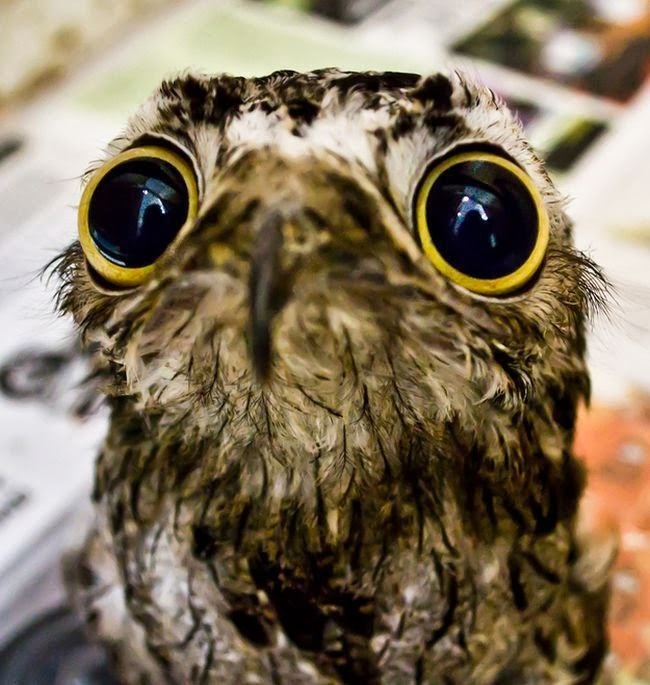 I suspect that the mystery potoo either has extremely dilated pupils or is a juvenile with all-black eyes (though I have yet to read anywhere that juvenile potoos of any species have black eyes). "Juvenile, paler throughout, decidedly white on head, back, breast and sides, with the barring and mottling of darker colors much reduced." I suspect that a conclusive taxonomic identification of this potoo from the photos alone will not be possible, and that it needs to be examined directly, but as yet I have not been able to find any further, more precise details concerning it, including its specific location or even if it is still there, or indeed still alive. "Brumfield et al. (1997) investigated the relationships among the potoos based in isozyme electrophoresis of 23 presumed genetic loci from 20 enzyme systems. The monophyly of Nyctibiidae was confirmed. The position of Nyctibius grandis within the family was not fully clarified. One interesting result of this study was the discovery of a large genetic distance (Nei's D=0.101) between one sample of grandis from Panama and two samples from Bolivia. In view of this genetic distance, and the geographical disjunction between populations in Amazonia and in southeastern Brazil, Cohn-Haft (1999) raised the possibilty that the Great Potoo may contain multiple cryptic species." Of course, the colour of the great potoo's irides is effectively irrelevant in relation to the mystery potoo's identity because the latter bird's eyes appear entirely black, its irides can't be seen - or can they? Yesterday, FB friend George Warren Shank, speaking about the mystery potoo photo that opens this ShukerNature post and also appears at bottom-left in the photo quartet, stated to me: "I noticed if you zoom in on this little guy you can see the gold rimmed eyes". When I enlarged that photo, I couldn't discern this, but my computer's viewing set-up mightn't be as advanced as George's or other people's. So if anyone else can perceive gold rims (i.e. gold irides) in that particular photo, please post your comments here, as I'd be interested to hear from you. Thanks very much. Huh, interesting. I checked Cleere & Nurney's Nightjars: A Guide to Nightjars and Related Nightbirds, and their illustrations and descriptions of the Great potoo pretty much match what we see in those new photos. Nevertheless, variation within that (and other) species could be an underappreciated problem - it certainly is with frogmouths (which reminds me..). The potoo picture (when enlarged) does have lighter rims at the top of the eyes. However the coloring is very dark brown, though noticeably lighter than the pupil coloring. This indicates that Darren may be right and that the reason the eyes look so dark is because the dark brown irises blend into the black pupils in the other images. By the way I have never found pottos demonic, to me they look like muppets. 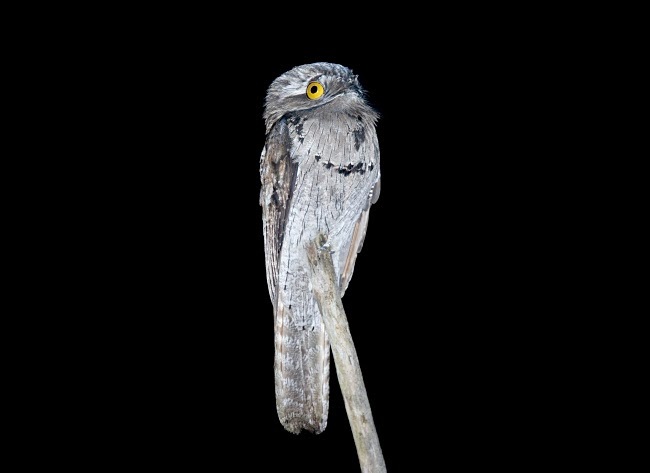 The bigger problem re its identity, however, is that the plumage colouration of the mystery potoo doesn't match descriptions of juvenile great potoos, the mystery bird being too dark. No, I don't think potoos (pottos are primates!) are demonic-looking either, and agree that they are much more muppet-like, especially their huge mouths. According to the "Handbook of the Birds of the World", the Great Potoo (Nyctibius grandis) has a brown iris and all other potoo species have a yellow iris. The plumage colour of the Great Potoo is very variable and can range from buffy-brown to nearly white. Yes, I have already noted these details myself in previous comments here, but as also noted by me, the iris is apparently more variable in colour than just dark brown, and the juvenile's plumage is much paler than the bird's in the photo. Is it just possible that whoever put the pictures up simply photoshopped the eyes to make them look creepy? Nope, I recently came across one of these a couple of weeks ago, its eyes were solid black and its mouth was HUGE! It appears to be a Great Pokoo. Dark brown irides can be distinguished in the upper left and lower left photos. The coloration of the plumage indicates the bird may be in the transitional age between juvenile and mature. The Potoo is now my favorite bird. I just found one of these at my place of work here in west Texas just a couple of weeks ago. I thought it might have been an injured baby owl. It's eyes were solid black and as I moved closer it opened its mouth, needless to say it startled me. He was fairly small, but didn't seem to be injured as he flew about 20 feet away and rested some more. I left him alone and checked again a while later, and he was gone. I wish now I had taken some pictures. Is it just me or does the potoo look huge? It's just a potent combination of close-up photography and forced perspective at work here. The great potoo's call makes me laugh! It's the sound of eider ducks that worries me. :) I have an odd perspective on what sounds creepy though. Tubular Bells 3 is my all-time favourite piece of music. LOOK OUT FOR THE INVISIBLE CATFISH!